I’m sure there are many people in the Stockton and Billingham area who went on holiday with Bee-Line in years gone by. 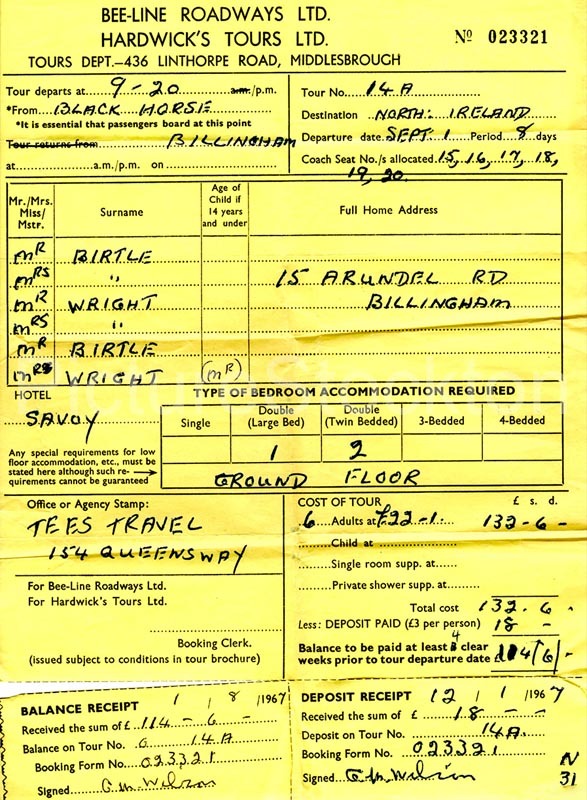 This invoice going back to 1967 was for myself, my parents, my grandparents and my uncle – our destination was Bangor in Northern Ireland. So what did we get for the huge sum of £22 and one shilling each ?. We left Billingham Green at 9.20pm on the Friday evening and drove through the night to Stranraer to catch the ferry to Larne. There was no direct route in those days and we went via Newcastle, Carlisle and a seemingly endless night time drive through Southern Scotland. Our ferry was delayed as a lady, thankfully not from our coach party, slipped off the gangplank and had to be fished out of the harbour. On arrival in Northern Ireland I was quite taken aback to see that all the policemen in the Province seemed to be armed and this was two years before the troubles started. When we arrived at our hotel, The Savoy in Bangor, we were one of seven coach trips there. Every day we had a full trip out going to places like the Glens of Antrim, Giants Causeway, the Mountains of Mourne and even a quick trip by boat into the Irish Republic. Luckily no customs officers were to be seen as this wasn’t strictly above board. If any of the ladies had purchased a watch south of the border, much cheaper than at home apparently, they were advised to conceal them about their person. The hotel provided us with breakfast and evening meals and we had lunch at pre arranged stops. All included in the price. If that wasn’t enough the hotel laid on entertainment every night as well just to make sure we had our monies worth. As an added attraction there was a singing competition between the 7 coaches which was held on our final night of the holiday. My mum Doreen conducted our bus to the tune of John Browns Body and we gave it our best shot. And it has to be said, modestly, that we won. A fantastic value holiday and we saw some lovely places. There was some real fun people on our coach and Timmy from South Bank still sticks in my mind. Image and details courtesy of Martin Birtle. Bee Line by heck that’s a blast from the past, When my Dad use to work shifts at ICI Wilton and we lived in Norton he used to get the Bee Line works bus each day. No fast roads back then of course, it made for long days for shift workers.